Back in January, I wrote about our customer support phone system, Nodephone. Based on Twilio's telephony platform, it allowed us to collect valuable data about our phone calls with customers. This post describes how the system works. Around two months ago, we started using our new feature tracking tool to log our customers' thoughts and comments. Often, however, we found feedback from calls was lost, as the process for recording it was still too time-consuming. With our new phone system, it is extremely simple to log a feature request whilst on a call. The agent simply enters the information in a textbox on-screen either during the call or immediately after. It is then submitted instantly to the tracker, complete with the caller's details, so we can keep them up to date on progress or get in touch if we want to delve deeper into their thoughts. Providing great quality support means providing great training for our support agents. Further, to keep close to our customers we insist that everyone in the company spends time on support. That means a lot of people who need training! 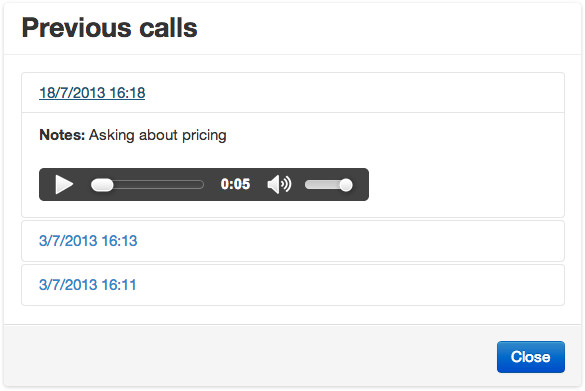 One powerful way we've found to help people improve is to play back calls and discuss them. Our new phone system makes that easy - thanks to Twilio, we're able to record every phone call, providing amazing resources for training and monitoring. Many of our potential customers first contact us via our support channels, so we want the handover to our sales team to be as smooth as possible. Now, we record data about prospects into Nodephone, and this is passed through automatically to our Salesforce CRM using their API. What's more, the process for our sales team of calling back leads is massively simplified with a smart integration between Nodephone and our internal Chrome extension. Click the "Call" button and your phone rings and connects you straight through. 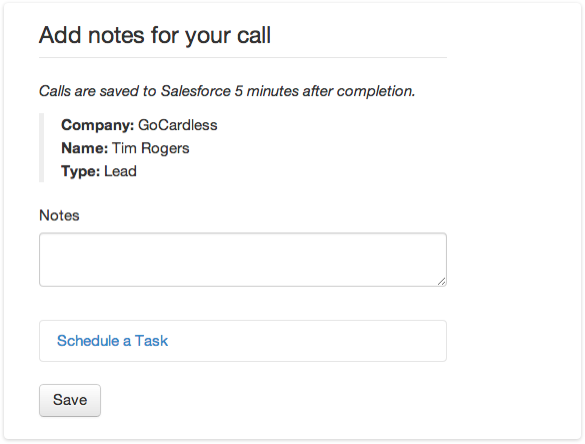 Make some notes or schedule a callback in the window that pops up, and all the data gets passed back through to Salesforce automatically, including the recording. Magic. This has increased the call volume our sales agents are able to make by about 20% - a real difference for our productivity. We want to provide awesome support, and that doesn't include waiting ages for an answer and then being sent around the houses. Our new phone system makes call routing simple, and ensures no-one waits longer than 3 minutes to speak to us. Now, when customers call, they begin at a quick 10-second menu where we work what they're calling about - whether they're paying someone, already collecting or looking to start taking payments with us. Once they've chosen an option, they enter the queue and show up in our revamped agent interface. After 3 minutes, if no-one has answered, all calls are forwarded to every phone in the office, ensuring a speedy response. As GoCardless has grown, we've needed to expand our support team. As we've done so, we've become more and more interested in a distributed support model, where agents work part-time from wherever they are. Historically, it's always been easy to answer emails from home but not so simple for phone calls. Our new phone system fixes that. When configuring Nodephone, agents enter the phone number they'd like to use when answering calls. Then, when they hit the "Answer" button, the call is put through to that phone. Agents can choose any phone number or even take the call direct from their laptop using Twilio Client. In the original Nodephone, we recorded plenty of data for long-term stats, but it wasn't easily accessible on a day-to-day basis. We've taken two steps to fix this. 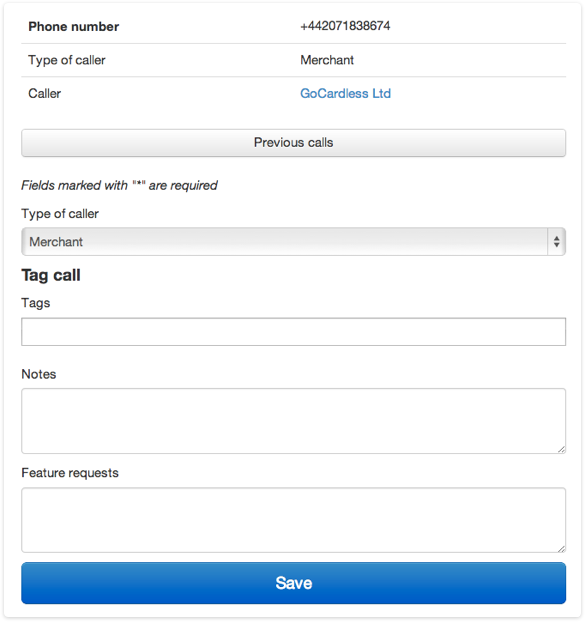 Firstly, we have a full interface for looking back at previous calls, incorporating recordings, notes and other data. Secondly, if a caller has called before, at the click of a button you can get an at a glance view of their previous interactions. Nodephone 2 is already bringing great benefits to our internal processes and our customers. If you're more of a technical type, stay tuned - in a few weeks' time, we'll have an in-depth look at the technical implementation of this new app. Are you excited by building great tools to solve real business problems? Join the GoCardless team.